Hey, month of August – SLOW DOWN! I don’t know what is going on with time lately, but it keeps racing by at record speeds. And everything seems to be happening this month. We have choir performances, art shows, bush camps, Olympics reports at school, tonsillectomies, birthdays, and mild cases of chicken pox making the rounds. It’s a mixture of worry, anxiety and excitement and to put it simply, I’m already wishing August was over! Luckily, for those moments when the kids are asleep and I have the illusion that everything is calm, I’ve discovered the perfect recipe to chillax with. 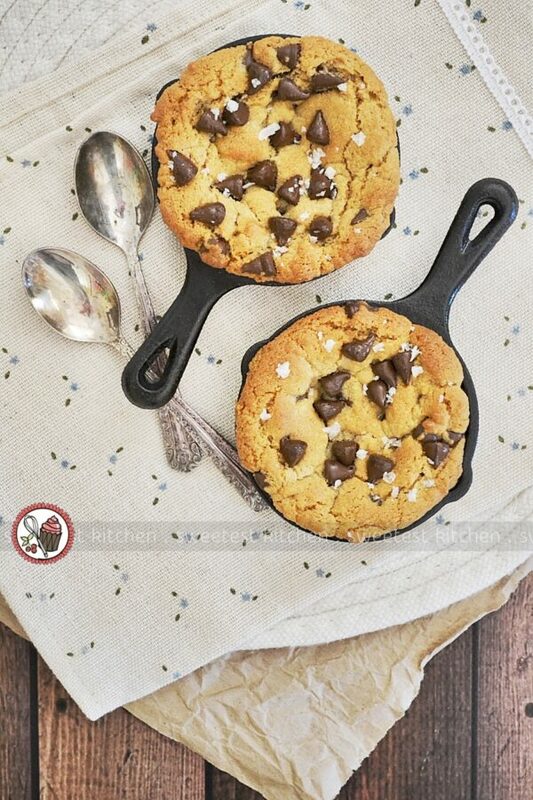 How beautiful do these peanut butter chocolate chip skillet cookies look! This, to my surprise, is a recipe straight from Donna Hay (Donna Hay magazine, Issue 88, Aug/Sep 2016). You may (or may not) be familiar with my love/hate relationship with Donna’s recipes, but who cares! I’m putting aside all my Donna-doubts today because this recipe is amazing – easy, quick and so satisfying! Do I need to drag out my stand mixer? No! How about my hand mixer? No! Well, I’ll still have to let the butter come to room temperature, right? No! How many fancy and expensive “Donna Hay” ingredients are in this recipe? None! The recipe has 11 ingredients (some are optional – peanuts, sea salt flakes and ice cream), which may seem like a lot, but trust me – you most likely already have all these in your pantry. 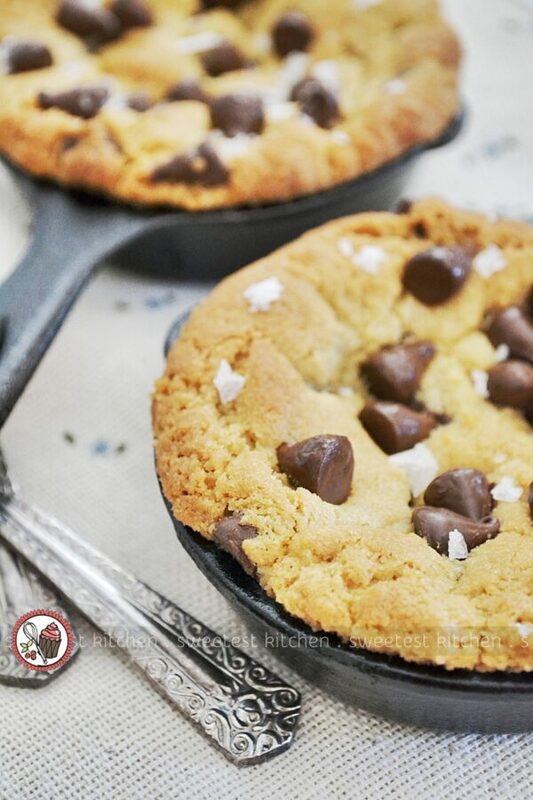 To whip these cookies up, you dump everything into a bowl at once, stir it together, transfer the dough to your mini skillets (or perhaps you’d like to use individual ramekins), and bake. But, of course, be careful not to over-bake, especially if you love gooey cookies. The tops of the cookies will brown rather quickly, so take them out of the oven when they are beautifully golden and puffed up. As the cookies cool, they will sink a bit, so don’t be alarmed. When still warm, sprinkle with salt, top with a scoop of ice cream and enjoy. 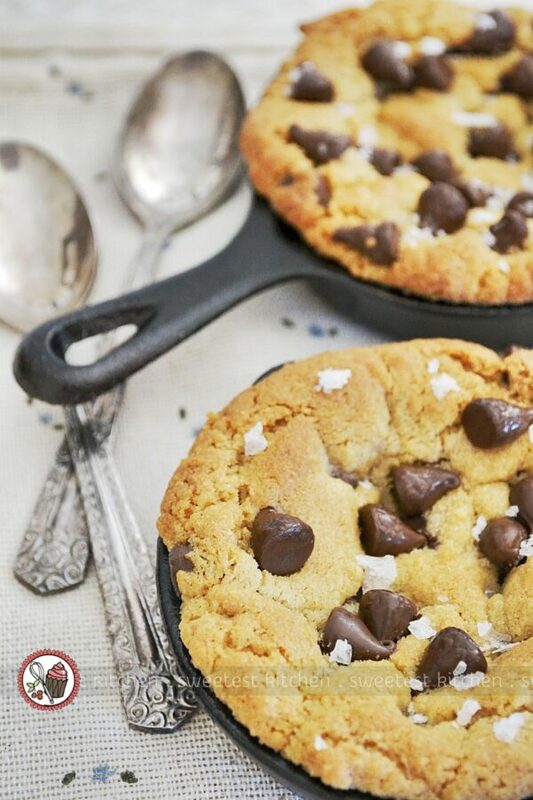 The cookies should be soft and dense, with the strong taste of a classic peanut butter cookie, hits of warm, melty, dark chocolate and bursts of sea salt. They’re absolutely brilliant! I usually don’t like nuts in food (like cookies, ice cream, or stir fries), so I left the peanuts out of my cookies. 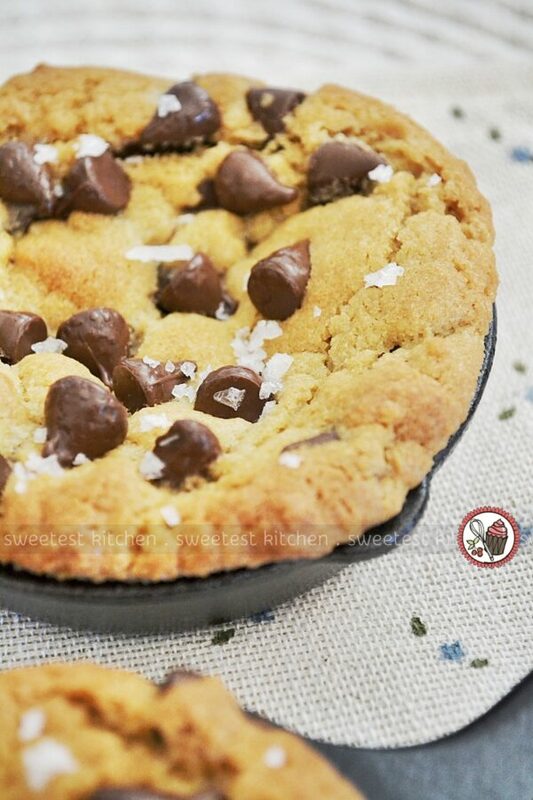 If you’re not a fan of sea salt flakes on top of cookies, you could easily leave them out and add a touch of table salt to the dough along with the dry ingredients. Doesn’t that look delicious! 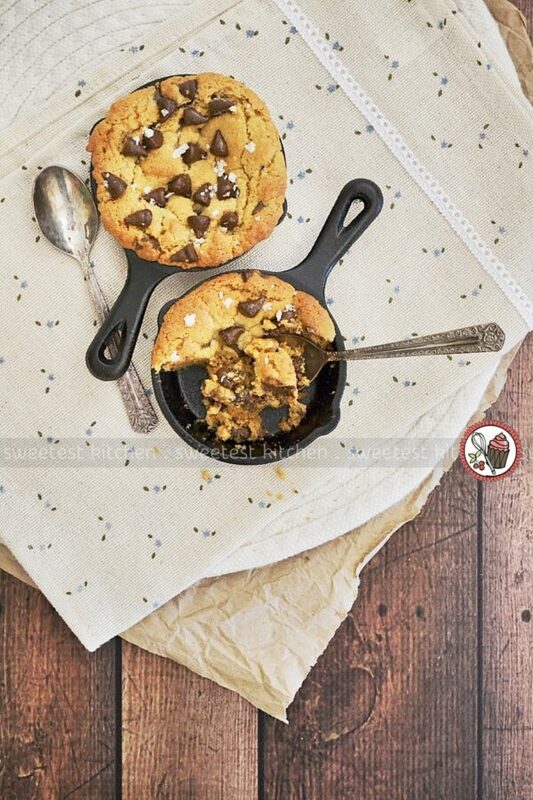 These little cookies are so moreish and so cute in their little skillets! I’m happy to tell you that these cookies will keep in an airtight container for a day or two (remove them from the skillets for storing), and can be gently reheated. Or, as I have also discovered, you can make the dough ahead of time and keep it in the refrigerator for up to two days (although the dough will harden and be difficult to scoop out)…. you know, for if you want that unique freshly-baked peanut butter chocolate chip cookie goodness a bit later in the night. Mmmm…. the perfect late-night indulgence! 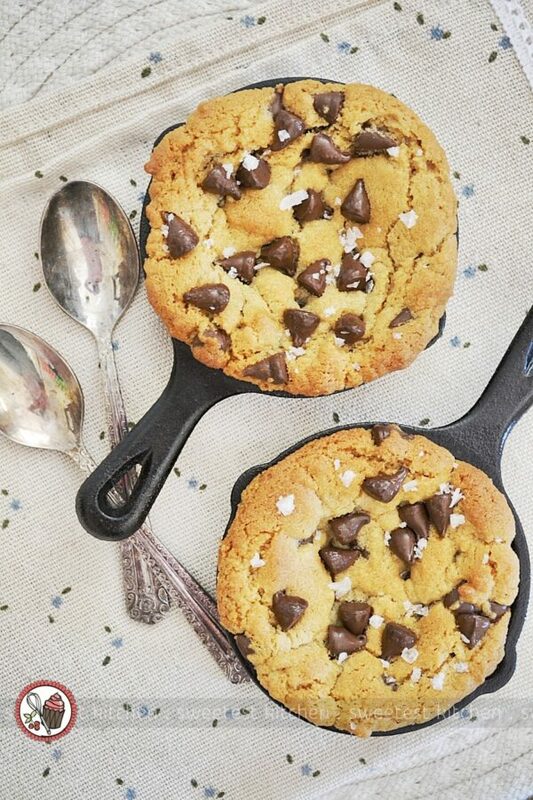 Perfect for a late night sweet-craving, these easy peanut butter chocolate chip skillet cookies can be whipped up in just a few minutes! Place flour, baking soda, brown sugar, caster sugar, egg, vanilla extract, peanut butter, butter, chocolate chips and peanuts in a large bowl and stir well to combine. Divide the mixture between 8 10cm (4in) cast iron skillets and press down to evenly cover the base. The dough should come about halfway (or a little more) up the sides of the skillets. 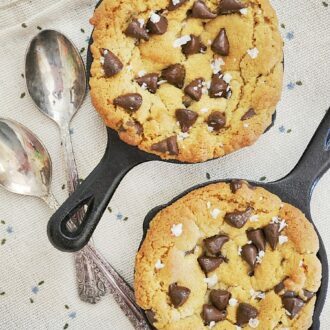 Place the skillets on a large baking tray and bake 15-18 minutes, or until the tops of the cookies are golden and puffed. The centers should still be soft. Cool slightly, sprinkle with sea salt and serve immediately with ice cream. * If you don't like sea salt flakes on your cookies, omit them and add about ½ teaspoon table salt to the dough mixture, along with the dry ingredients. 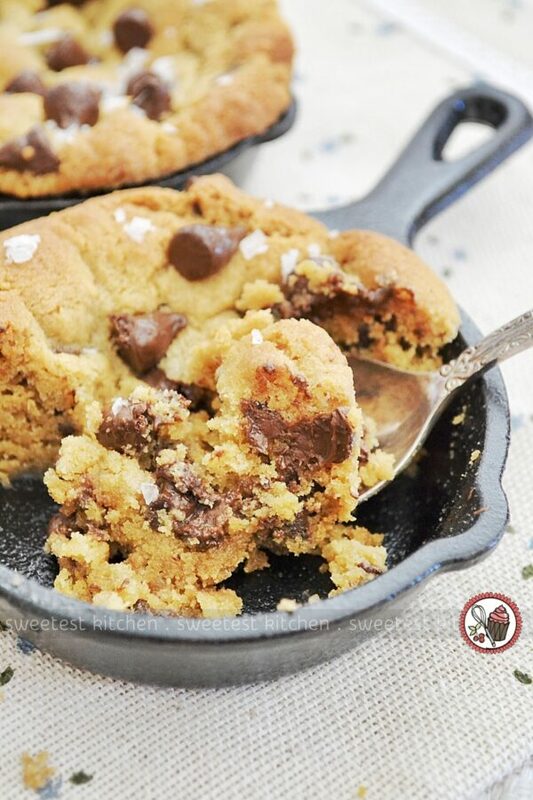 If you don't have mini skillets, you could bake these cookies in ramekins instead. I usually divide this recipe in half. If you decide to do this as well, just simply halve all the ingredients. To halve the egg, crack it open into a small bowl, gently whisk it with a fork to combine egg white and yolk, then pour about half the whisked egg into the dough mixture.